Battle the DROID SnowBot in a Snowball Fight! I’m not sure what it is about the Droid SnowBot, but I love this thing. And now, it’s even more awesome, since you can battle it out with him in a snowball fight over at Verizon’s Facebook page. The game is sort of simple and cheesy, but if you have a webcam you might actually work off a little of that Thanksgiving flab by dodging left and right. 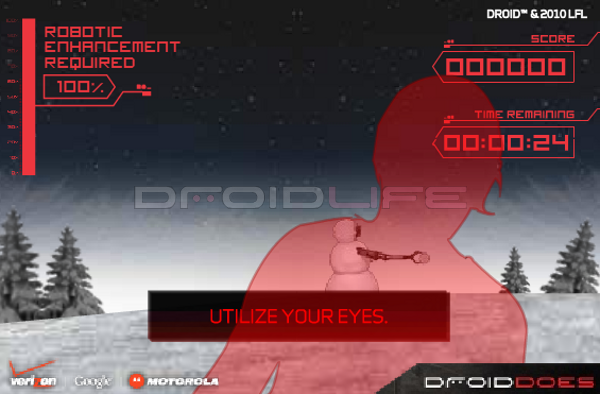 As each snowball hits your screen, you are greeted to some of the Droid lineup selling points, so do your best to ignore those and just dominate the game.